World War I Bridges - WW1 Centenary from the river Piave: Trieste 1914. The city and the war. 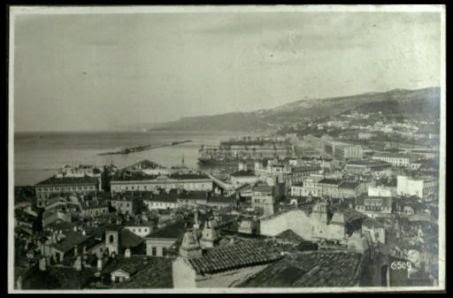 Trieste 1914. The city and the war. The city of Trieste was and still represents a special observatory for understanding what’s going on in the heart of Europe, for following out the changes in the Danube region, the Balkans and the Mediterranean. Established in Roman time, Trieste voluntarily entered the Habsburg realm in late 14th century, also to strengthen his position against its main competitor for trade in the Adriatic, namely Venice. However only in 1857, after the extension of the Vienna railway to Trieste, the city completely coupled with the high Austrian protective tariff and became the major port of the Empire and, by the eve of the First World War, the eighth busiest port on earth. Besides the entrepreneurial class and the high bourgeoisie, it offered a lively stage also for the middle and the working class, which has been growing over a short period of time due to the economic expansion. But Trieste was not only an important port and industrial and financial centre, it had a deeper symbolic meaning for the Habsburg Empire, since it declared that the vast continental sovereignty of the Dual Monarchy consisted also of a maritime power. At the same time, the city was also a cosmopolitan cultural centre, attracting writers, artists and intellectuals and bringing them in contact to each other (just think about the friendship between James Joyce and Italo Svevo). Like the Habsburg Empire, also Trieste was a multiethnic city: it grew as a result of the high immigration of people from all over Europe and combined cultural, religious and linguistic diversities. Politically and culturally related to the Habsburg, and yet opened to the Slavic world, Trieste remained geographically and historically linked to Italy, at the point that Italian remained its working and cultural language. If we consider all these elements, it’s easy to put one leg of a virtual compasses on this city and draw with the other one a circle on the geographical and historical meaning of the First World War, especially on the eastern front. And this is what a new exhibition in Trieste tries to do. Located in the Magazzino delle Idee, (near the Main Rail Station, entrance from the dock, on the sea side), and supported by the Province of Trieste in partnership with the Regional Institute for the History of the Liberation Movement in the Friuli Venezia Giulia, as well as the State Archives of Trieste, the Italo German Historical Institute in Trento and the Universities of Ljubljana and Trieste, this small but interesting exhibition Trieste 1914. La città e la Guerra enables the visitors to approach the Great War through the specific lens of this city. It offers a narrative pattern which runs from the assassination of Archduke Franz Ferdinand of Austria and his wife, whose funeral procession run through Trieste in summer 1914, to the increasing limitations of both the civil and economical life (by the prohibition of associative activities and control of the citizens’ movements, on the one hand, and the naval blockade which caused the collapse of the maritime industry, on the other hand), from the conscription of all young male sent to the front and the related family tragedies to the terrible famine suffered by those still living in Trieste during the World War One, from the echoes coming from the near battlefields of the Isonzo-front and the Carso to the Red Cross intervention for the population.